All Boeing 737-300s, 400s and 500s that have taken off and landed more than 30,000 times have been taken out of service to undergo immediate inspection. The move follows Friday’s incident when a Southwest jet split open mid-flight. On Friday a Southwest Boeing 737-300 had to make an emergency landing after a hole appeared in the cabin roof as the plane flew over Arizona. One of the cabin crew suffered minor injuries. Cracks were found on three Southwest 737-300s during metal fatigue inspections following the incident. US aviation regulators, the Federal Aviation Administration, say that around 175 older planes owned by a variety of carriers must be examined within the next five days. 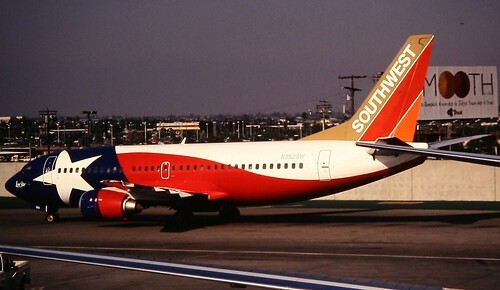 Southwest has cancelled hundreds of flights as it rushes to comply with the FAA’s directive. There are around 1,800 older Boeing models in service at the moment and they are the most widely used plane in the world. It has been reported on the BBC website that three of Bmibaby‘s Boeing 737-300s fleet have also been taken for testing. In a statement, a spokesperson for Bmibaby said: “We have an extremely strong culture of safety within Bmibaby and all of our aircraft undergo regular maintenance checks and constant monitoring by our engineering team. “Following the release of Boeing’s service bulletin on Tuesday 5 April 2011, three bmibaby Boeing 737s will be required to undergo the additional inspections. Three other UK passenger carriers operate the 737 Classic range – Thomson, British Airways and Jet2.